Inefficient farming practices are helping to drive deforestation, pollution, ocean degradation and species loss, and constitute the most serious environmental threat in the world today, according to a new global survey by Dr. Jason Clay, head of the Center for Conservation Innovation at World Wildlife Fund (WWF) and noted expert on the economics of agriculture. Agriculture is the world's largest industry, employing some 1.3 billion people and producing about $1.3 trillion worth of goods annually. But in World Agriculture and the Environment, Clay also finds that agriculture contributes to serious environmental, social and economic problems, particularly in developing countries. Offering detailed analysis of the issues and practices of some of the world's biggest crops, from coffee and orange juice to cocoa and tobacco, Clay finds that agriculture uses more than 50 percent of the habitable area of the planet, including land that should not be farmed, and destroys some 100,000 square miles of forests and other critical species habitat annually. Among the findings in Clay's book: Agriculture wastes 60 per cent, or 1,500 trillion liters, of the 2.5 trillion liters of water that it uses each year. Water resources are already being used close to or beyond their limit, particularly in the Americas, North Africa, the Arabian Peninsula, China, and India. The impacts of global warming are likely to further disrupt water supplies. "Agriculture has had a larger environmental impact than any other human activity and today it threatens the very systems we need to meet our food and fiber needs," said Clay. "New kinds of agriculture can produce the food needed to feed an increasing population and still accommodate all other life forms on the planet." 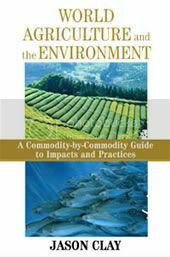 The book warns that government subsidies encourage intensive monoculture farming practices that use chemicals and heavy machinery that harm the environment. "U.S. farmers are on a treadmill: the more subsidies they receive, the more they need them to remain competitive globally," said Clay. The book recommends that governments - especially those of major consuming countries like the U.S., China, Japan and the EU -- redirect funding from subsidies and market barriers that promote unfair competition towards the adoption of better management practices. These include government payments for environmental services that farmers provide, such as watershed protection, erosion prevention, clean water, and carbon sequestration. Clay analyzes aquaculture as well, the fastest growing food production system in the world. He says that without great care, it will repeat many of the same mistakes as agriculture. "At the very least, our goal should be to avoid repeating old mistakes." The seafood that Americans consume is mostly produced by aquaculture. Much of this industry has huge environmental impacts. "When you consider that most species are over-fished, the trend of concern in aquaculture is the growth of open ocean systems producing carnivorous fish," said Clay. These fish require three to five pounds of wild fish to produce one pound of farmed fish. It's not a good trade-off. It's inefficient." The book recommends that governments work with farmers and the food industry to develop better management practices in order to increase efficiency and reduce damage to the environment. WWF and the International Finance Corporation, the World Bank's private sector financing arm for developing countries, are exploring financial incentives that encourage farmers and investors to adopt better management practices, for example ecolabels promoting environmentally-friendly products and offering a reduction in financial risks. The book highlights palm oil as the agricultural commodity with the biggest threat to the widest range of endangered large mammals. Asian elephant, Sumatran rhinoceros, orangutan, and tiger populations are all declining because palm oil plantations are destroying their habitats.